Jamie Murray believes he and doubles partner John Peers are a match for any team after winning their opening match at the ATP World Tour Finals. Murray and Australian Peers won a dramatic match against the Italian duo of Simone Bolelli and Fabio Fognini 7-6 (7-5) 3-6 11-9. 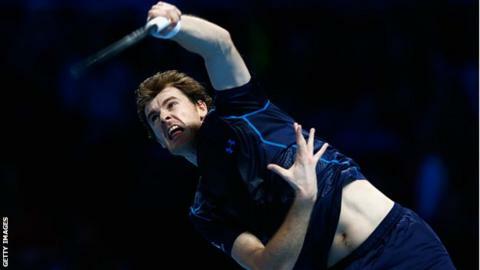 "I guess we're one of the best teams in the world, that's why we're here," Murray told BBC Scotland. "Every time we step on court we feel we've got a chance to win our match." Murray confessed to some pre-match nerves ahead of his World Tour Finals debut, but was thrilled to make a winning start to the round-robin stage. "I was a bit nervous going out there, which I guess means it meant a lot to us," Murray said. "We did great to win, it was a real high level match. Everyone on the court was playing a lot of good tennis with exciting rallies. Really happy to come through at the end. "It's obviously nice to get off to winning start, get a bit of momentum going early in the tournament." With Great Britain's Davis Cup final tie against Belgium looming at the end of the month, Murray, 29, has plenty to think about over the next few weeks, but he's adamant that his only focus right now is the Tour Finals. Despite enjoying great success with partner Peers this season - they won titles in Brisbane and Hamburg, were runners-up at Wimbledon and the US Open and could end the year as the world's number one pairing - they will go their separate ways after this tournament. "It's been a great year for us," Murray continued. "We've done three years together now and I think we both kind of felt it was time to move on. A fresh start, try something different." "I'm going to play with Bruno Soares next year. I'm really looking forward to that and hoping to be even more successful than I was this year." "Any decision comes with risk, especially after the year we've had. We both know we can do great things together, but we both felt it was time to move on, do something different and that's why we're going our separate ways after this tournament."